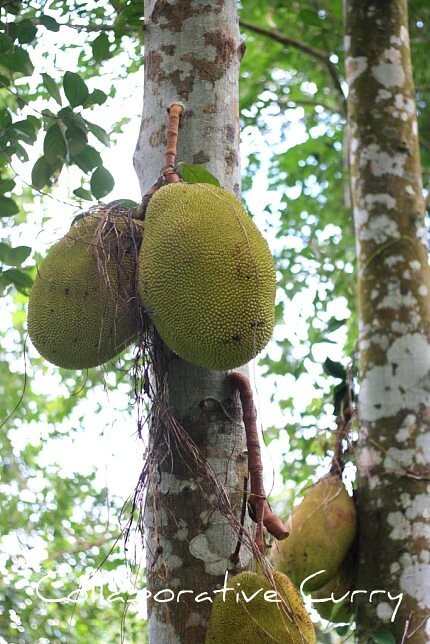 Jackfruits are one of the biggest blessing during humid summers in Kerala. Loved as much as the mangoes we use this summer fruit in manifold ways to turnover scrummy dishes. Believe me when I say this we really make use of every part. The fruity flesh is enjoyed as is and turned into cooked sweet delicacies. When raw we cook them fine adding chilies and coconut and make a savory side dish for rice or eat is with spicy fish curry or pickle. Coming to the seeds it can be turned into unbelievable variety of dishes as well. Paired with other vegetables or alone they make great dishes to be enjoyed with rice. It makes me drool just writing about all the delicious stuff. 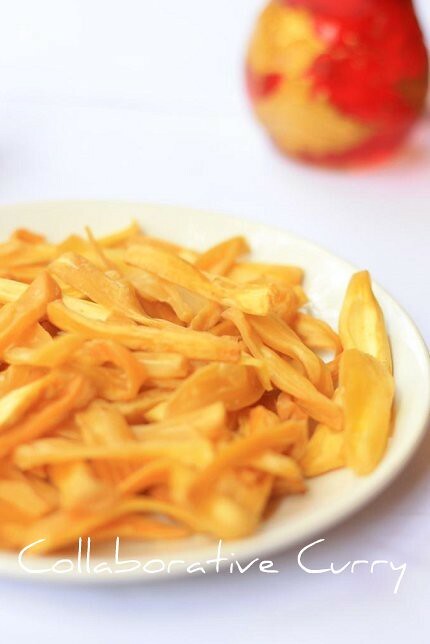 Without further ado today's recipe is the crispy fries made with the raw flesh of the jackfruit. They are one of our favorites and while in Kerala I had a chance to make them with family. It was a wonderful time both making and munching on them over tea and chitchat while the rain splashed away keeping pace with our own relentless chatter. Simple pleasures of life. By the way, I did mean it when I said we use every part of the jackfruit. The jagged outer husk is fed to the cattle. 1.Clean the raw chakkachula (edible white part)and slice it equally.Cut off both the top and bottom edges. 2.Bring the oil to smoking hot. 3.Throw in the pieces and fry till it is done. The time depends on the thickness of the pieces. 5.Take out and spread on a paper towel and let cool before storing in an airtight container. thats one of my favourite summer fruit. looks so good. often buy it from hot chips stall near home for evening tea. Kothy sahikunilla Nami..Kidilan..evide chakka kitumo?? Wow, they look great and crunchy !!! Chakka varathu kanichu kothipikalle, my favorite, missing them lot. I would do anything to get a packet of those now..sigh! lovely and crispy jackfruit chips. WOW..love those jackfruits chips...and love this heavenly delicious fruits but its been long long time I had this fruit in any form..great pics especially the last one where the fruit is hanging on tree.. I love Jackfruit but can't find here :(( Nyways this chips looks great!! you are making us nostalgic... feel like going home... we love these chips.. beautiful pics..
Fabulous and crispy chips looks marvellous.. Very crispy mouthwatering chips. I used to have this when I was a kid. :(....we do not get jack fruit here and we love these chips....!!! I like jackfruit but have never tasted them as chips. Thanks for showing me something new. wow! This is my favourite, i always use to buy it from shop, never made it before. Your chips are so tempting and brings back my childhood memories. Crisoy and yummy chips.. Engane kothi pidippikkano Nami?? Korachu eduthu kalanjittu kazhicholoo tto.. This is one of the things that I get reminded when someone talks about Kerala cuisine. Looks crispy and yumm. i just love them..looks fantastic.. Fantastic chips! Great work Nami!! btw thanks for visiting my blog n for giving such lovely n encouraging comments..
Looks delicious! Lovely pic as well! If I'm not wrong these are fried in coconut oil rt? I have eaten this long back , but never knew it was made this way...In Delhi, if I ever get the jack fruit I make Vege mutton out of it. It is very expensive here. 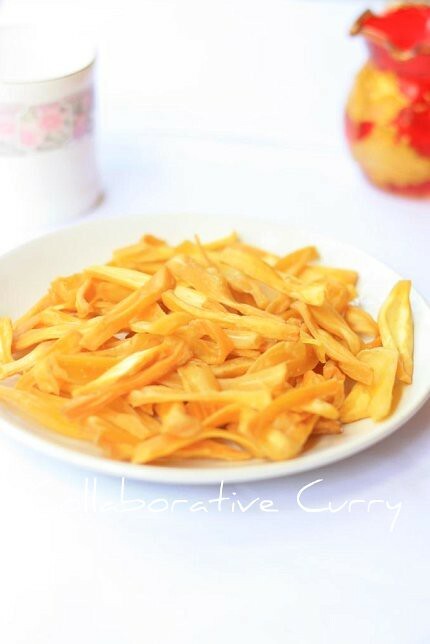 lovely cripsy chips, i can easily find jackfruit, must make this one day. Have a great weekend ahead. hie....being a punjabi...jackfruit chips were unheard of!....am definetly gonna try 'em....they look scrumptious!!!!!!!!!!! Muhaaaaaaaaa I hav enot had them freshly made at home for years and years. This is something mom made every year in heaps. WIsh i could grab even just a hand full. its all time fav snack..whenevr i visit kerala, i buy them for sure..
Miss this and the Jackfruits just brought a huge wave of nostalgia! Nostalgia!!! Hope to see many more pictures of India trip and delicious recipes. oh wow! those look great! simply awesome fruit and chips. I think I'm severely missing out by never having had jackfruit! This looks delicious..the perfect way to spruce up some dishes! i love these!.. nice click! Never had jackfruit chips...bet they are addictive! wow never eaten or cooked with this veg/fruit.Sounds interesting. This is a standard snack at home as my boys love it!.Never tried making it at home though. Lovely clicks!! I am drooling here. Never tasted this before, but feel like eating some. Absolutely delicious. hello ladies, Sorry havent popped in for a while, been a little slow with the catching up , looks delish.